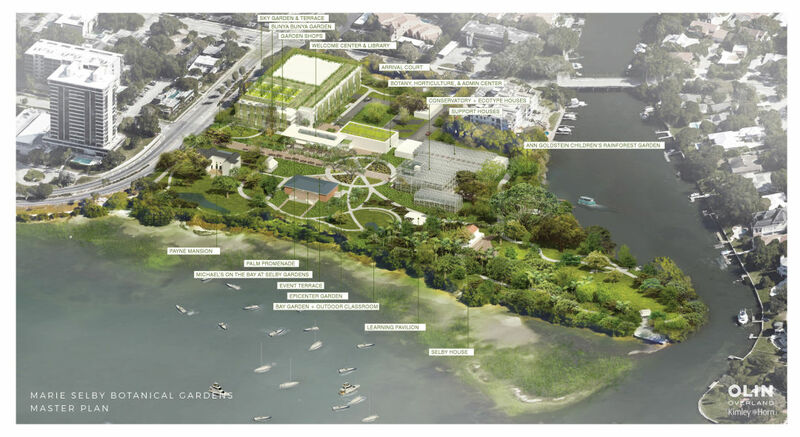 Marie Selby Botanical Gardens released details of a 10-year, $67 million master site plan created to increase green space at the gardens by 50 percent. Marie Selby Botanical Gardens on Monday released details of a 10-year, $67 million master site plan created to increase green space at the gardens by 50 percent and to protect its scientific collection from sea level rise. The plans, developed by the landscape architecture studio Olin, include the removal of some non-historic older buildings and the construction of a five-story parking structure with a garden and rooftop restaurant, a new welcome center, research and support facilities and more. The first phase of the project—which includes the parking facility and garden, the welcome center and the collections facility—is estimated to cost $35 million.